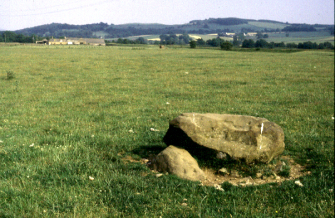 SMith's Stone is a large natural boulder located in the midst of a field known as Race Muir. On it is a crude inscription reading W SMITH W.
WIlliam Smith, a lad of 18 years, wqas apprehended by Cornet Baillie, commander of the garrison at Caitloch, and questioned regarding the whereabouts of other Covenanaters. As he refused to answer he was held overnight. Despite his father pleading with the local laird, Smith was sentenced to die. He was shot at the stone here. He was buried at his parents' house, but was subsequently reburied in Tynron kirkyard.